Here is my submission for the Frugal Fall Contest. It's my 4-year old daughter, Clara, on her first pre-K field trip. 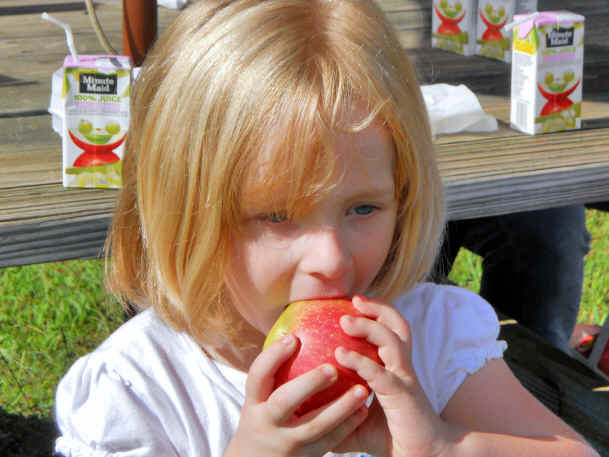 Apple picking at a local orchard here in VA. She's just taking the first bite of one of her fresh picked apples and "enjoying the fruits (get it?) of her labor!" There are some awesome orchards in VA and so much cheaper than buying in the grocery store, plus it helps support the local economy, spend quality time with the kids and much better selection of product when you pick it yourself! We've also done strawberries and pumpkin picking this year, but next year hope to hit blackberries, peaches and a few others - all right here within 20-45 minutes of our house.